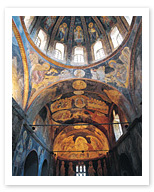 Dating from the early 12th century, the former Church of The Saviour in Chora contains some of Istanbul’s finest Byzantine frescoes and mosaics, depicting the life of Christ, which are superbly preserved and tremendously evocative. Plastered over during the 18th century when the Chora became a mosque, these vibrant and important pieces of Byzantine art were originally commissioned in 1315 by philosopher, theologian and senior Byzantine official Theodore Metochites. The frescoes were not brought to light until W.W.II, when they were discovered by American archaeologists Wittemore and Underwood. The frescoes and mosaics you will see here at Kariye are not only truly amazing works of art, but are significant, moving pieces of history.